1 Season salmon, if desired, with salt and pepper. Broil or grill salmon until salmon flakes with a fork. 2 Meanwhile, melt margarine in small saucepan over medium-high heat and cook shallots, stirring occasionally, until tender, about 3 minutes. Stir in milk and water bring just to a boil. Reduce heat to low, then stir in Knorr® Alfredo Pasta Sauce Mix. Simmer, stirring occasionally, 4 minutes. Stir in lemon peel and peas; heat through. 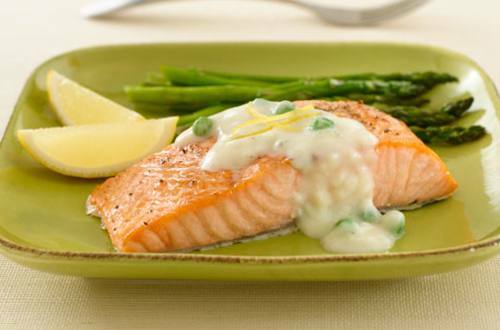 Arrange salmon on platter, then top with sauce.